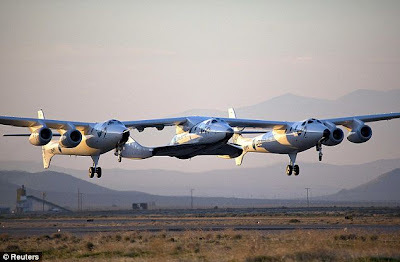 Virgins Ufo Shaped spaceport is readying for flights in 2013 ! Amazing illustration of Virgin Galactic's Ufo shaped spaceport has surfaced (see below). The spaceport is being completed in time for the launch date in 2013 of the virgin galactic craft. It seems that New Mexico is the preferred choice for many future space developments, and i can assure you the location and ufo shape is no co-incidence. If they really want ufos to land then this spaceport makes for an ideal location as it will be clearly visible from the upper atmosphere. Phase one of the world's first commercial spaceport, which will be the hub for Virgin's consumer spaceflights, is now 90 per cent complete. The 1,800-acre Spaceport America site, in Las Cruces, New Mexico, is the home base for Virgin Galactic, Richard Branson's most ambitious business venture yet. While NASA is out of funds and the current shuttle is retired, the US government would like us to believe that they have handed the space race over to the hands of private industry. Infact it is quite the contrary, with China's space race on the rise, the US government has merely outsourced work and combined research effects with private industry in an attempt to cash in on the upcoming commercialization of space.